How to get there: From Denver, take Interstate I-70 west across the Continental Divide (Eisenhower tunnel) and down to the small village Silverthorne. Get on Hwy. 9 south here and continue to the ski and resort village Breckenridge. Drive through town and make a left turn at the very last traffic light. This road is called Boreas Pass Road. In summer, this road gives access to a trailhead on the south side of the mountain. From the traffic light in Breckenridge, drive approximately 2 miles (or 3 km) up Boreas Pass Road, then look for a paved road that forks left and is named Baldy Road. Baldy Road is also numbered as road 520. Continue uphill on Baldy Road for another 2 kilometer (1.3 more miles). Here, this road ends. A smaller 4WD road that is not plowed in winter continues straight ahead. There are paved roads going both left and right, serving vacation homes. This is the trailhead, there is limited parking on your right (near a sign for a bus stop). This location is N39:28.103, W106:00.737, elevation 3236 meter. Route description: From the trailhead, ski along the smaller dirt road that continues the direction of Baldy Road. This road heads into the forest and climbs gently. Higher up, there may be a fork with ski tracks going either way. Take the left branch and continue a bit further uphill. Soon, the road makes a distinct bend to the right as it crosses under a power line. Continue up to an old building called Iowa Mill (see picture below). From here, the skiing terrain further uphill is excellent. There are scattered trees, then a large open slope that extends uphill to the north ridge of Bald Mountain. The best skiing follows a very broad gully that traverses slightly right when viewing the structures on the ridge from below. Ski up this excellent slope until you reach the ridge. Consider the snow conditions along the ridge. 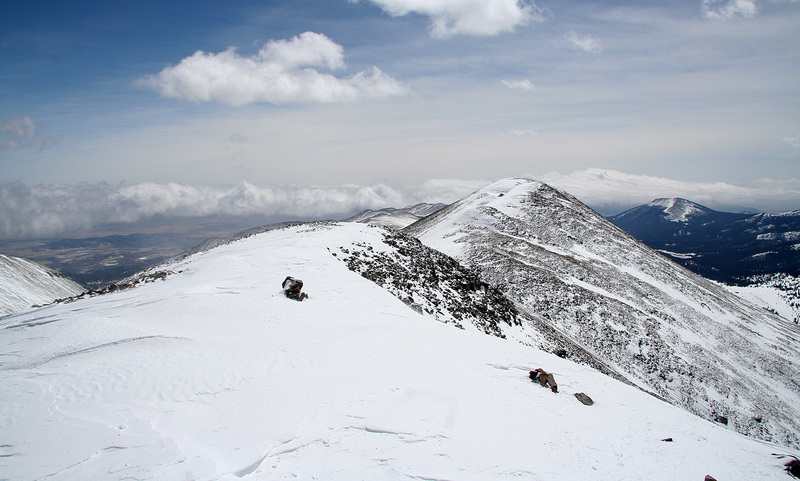 When I was there in early April, there was too little snow and the ridge part of the climb had to be completed on foot. Follow the ridge uphill. Beware of a dangerous cornice on your left (east side), this is most pronounced along the first part of the ridge. Cross the first hump, descend only slightly and continue the ascent. Higher up, there is a hump that ends in what may appear as a vertical drop to a notch below. However, this is easily bypassed on the left side. Continue uphill, either on the top ridge or a few times slightly on the right (west) side. The ridge becomes somewhat more gentle and slightly wider as you approach the summit. 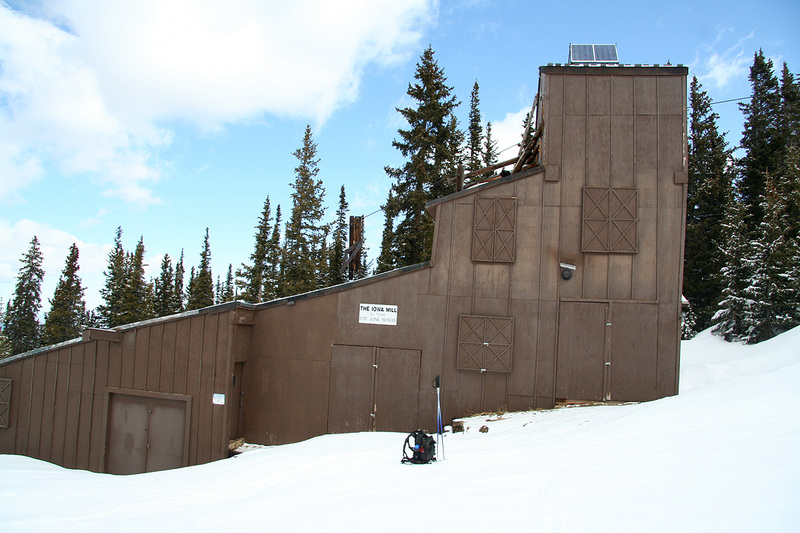 Comments: I dropped Pål Jørgen and Tor Erling at A-basin around 0915 and headed to Breckenridge and the trailhead. The new snow that fell yesterday was wet and called for "red extra" ski wax. I was ready to ski at 1000. The first part of the trail (on a summer road) is fairly popular, I did not see anybody, but quite a few ski tracks that could only date from yesterday. Higher up, at the fork there were ski tracks going both left and right. I took the right track (which turned out to be wrong), however, this track traversed right and I soon decided to leave it and broke my own trail more or less straight uphill. Soon, I intersected the correct trail just as it arrived at the Iowa Mill. From here, the skiing was just perfect. I zig-zag skied uphill and observed a couple of Telemark ski tracks coming downhill. Clearly, these skiers had been here to enjoy the fresh snow that fell the previous day. The sun was shining and the cloud that sat higher on the mountain when I started had moved elsewhere. I reached the ridge and tried to ski onwards, but there were too many rocks. I cached the skis at location N39:27.387, W105:58.747, elevation about 3900 meter. It had taken me just under 2 hours to get this far. The hiking was sometimes a bit cumbersome due to the mix of loose rocks and snow, one has to be extremely careful when placing the foot in this kind of terrain. I followed the top of the ridge most of the way carefully avoiding possible cornices on my left side. At one point, I reached a notch and further progress blocked by what appeared as a vertical cliff. I down climbed to my right side, only later (on descent) to see that there was a much easier bypass if I had explored the left side. A smaller notch further along was fun to cross as the wind had created a cornice perpendicular to the ridge. One could safely step straight through it, then descend a few steep steps to the bottom. 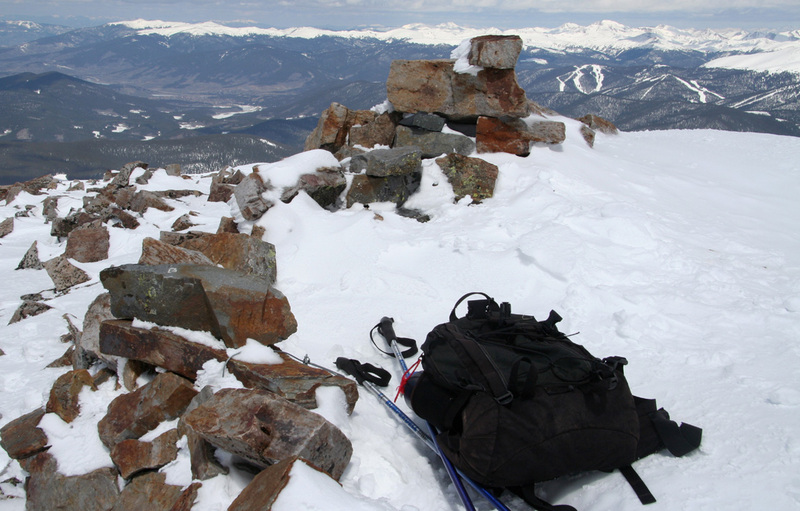 Gradually, I climbed the somewhat broader and gentle final ridge to the summit. I reached the top exactly at 1300, 3 hours from the car. 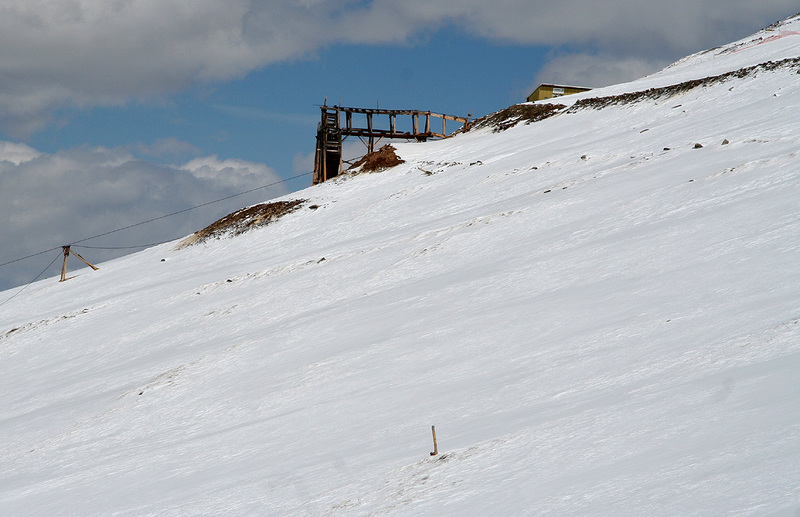 The summit register was buried under hard snow, only its wire was visible. I took a sequence of summit photos before leaving. Just as on the top of Silverheels, it was pretty windy, however not quite as strong as the conditions experienced there. A big blanket of clouds covered the eastern side of the mountains. The visibility was generally less than three days earlier. The Ten Mile Range and the Front Range were still pretty nice as seen from this summit. Breckenridge is right below and a sequence of pictures gives a good view of this ski area where we rented a house for Easter in 2001. I left after about 15 minutes and returned to the skis in about 45 minutes, generally improving on my route since routefinding on this ridge was easier going down than up. The skiing was very nice and in just 30 more minutes I was back at the car. Going down, I met a single Telemark skier coming up in order to enjoy a run back down as a well deserved reward for the hard work of ascending. 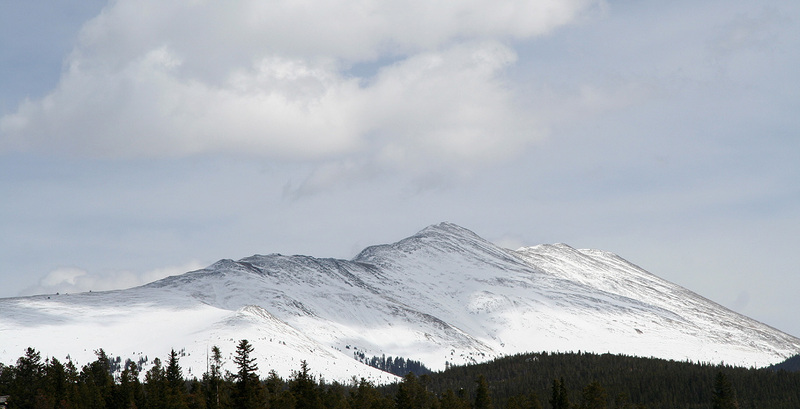 Bald Mountain, as seen from Breckenridge. The Iowa Mill. The terrain above here is very nice for skiing. Old mining ruins, near the north ridge. The north ridge, the route proceeds up here. The summit, note the wire to the trail register. Nice skiing, above the Iowa Mill. 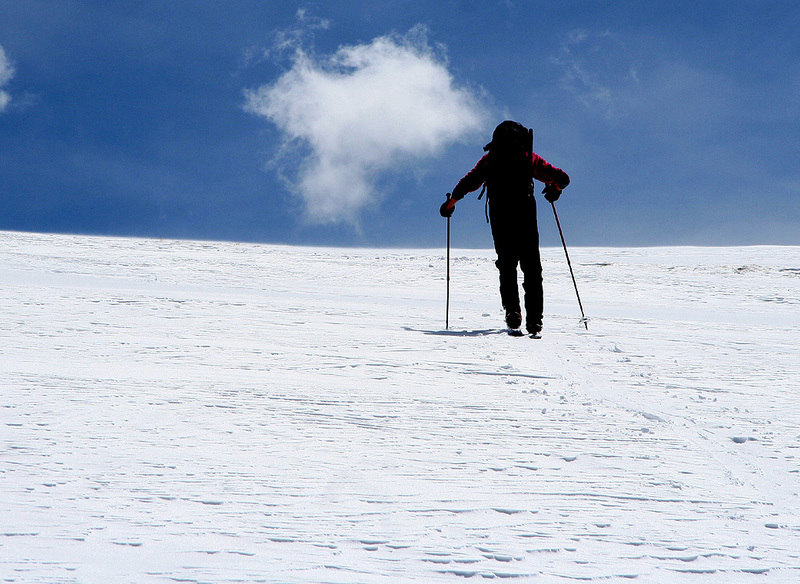 A Telemark skier, pushing uphill in order to enjoy a nice run back down. Panorama view I, first part of the Ten Mile Range. 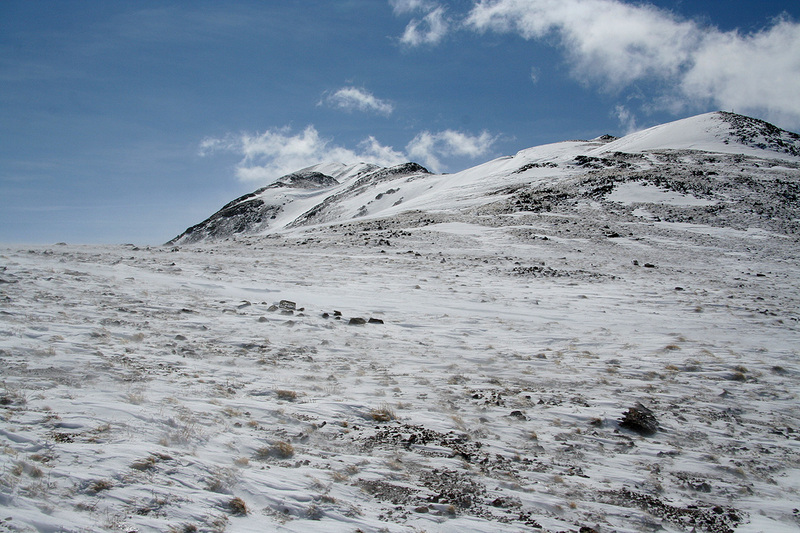 Panorama view II, second part of the Ten Mile Range. Panorama view III, first part of Front Range view. Panorama view IV, second part of Front Range view. 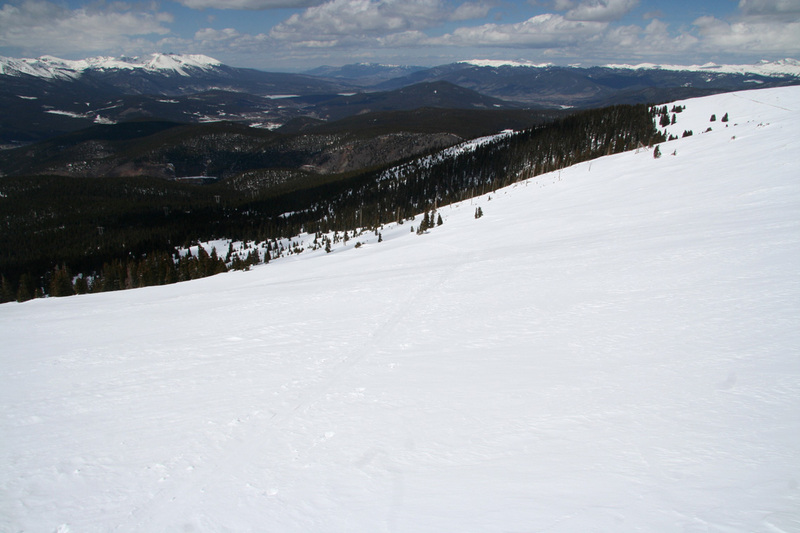 Breckenridge ski area, as seen from the summit.